Over the years, I’ve realized that my addiction to gummy things might actually be an addiction to gelatin—the protein that forms a matrix and gives jello or candy its dense, chewy consistency—as opposed to the sugar of the candy. I base my hypothesis on two interesting points: 1) Gummy treats made with agar agar (a gelatin-like protein derived from kelp) are not as appealing to me, and 2) The first time I was exposed to Vietnamese pho that contained cooked tendon (which is almost pure gelatin and isn’t sugary at all) I went crazy for it. Another interesting fact is that I have dealt with stiff, creaking, cracking joints my entire life (and two of my cousins have as well). My theory is that something about my dietary history or genetics left me in need of proteins to support healthy connective tissue, which may have led to my cravings. Since going paleo, I have automatically increased the amount of gelatin in my diet by eating more slow-cooked red meats–rich with connective tissue–and making my own stocks and bone broths. But I still love gummy things, so I decided to go with my instinct and try to get even more gelatin into my regular routine. Obviously I can’t be mainlining gummy bears every day, but luckily the paleo blog-o-sphere is overflowing with interesting homemade gummy recipes. Diane Sanfilippo of Balanced Bites seems to share my craving for all things gelatin and recently posted some recipes for lemon-lime and fresh berry gummy candies, as well as some links to some other fruity recipe ideas. I also stumbled across these recipes for “creamsicle” gummy candies, which I thought was a clever twist. But while all these recipes look delicious, I wanted something that had less of a fruity punch (lol). Instead of juice, I started playing around with coconut milk and came up with a recipe that is still sweet, but is a lot more subtle and almost has a savory edge to it. I call it “horchata” because it tastes very similar to the sweet, Mexican rice-based drink (which is very much not-paleo but very much delicious). I hope that other people who are looking for less-sweet gummy recipes might find it interesting as well. Heat the coconut milk, honey/sweetener, and cinnamon over the stove on medium low. You’re just trying to warm up the coconut milk to a good temperature to dissolve the gelatin. Don’t let it boil too long or you’ll start to reduce the coconut milk and then your proportions might be off. Once the milk is heated all the way through (it should be hot to the touch but not scalding), take it off the heat. Slowly add the gelatin a little bit at a time. Whisk until it is dissolved before adding more. If you go too fast, the gelatin may form clumps, which is fine to eat but may mar the final appearance of the gummies (if you’re picky). Once all the gelatin has been added and dissolved, pour into a baking pan or terrine to cool. 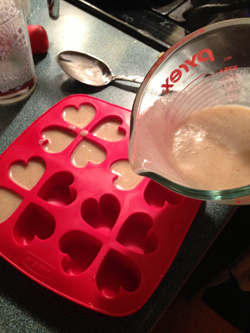 If you want, you can pour it into moulds to make fun shapes. I used these silicone ice cube trays I got from Ikea ages ago. Let cool, then either remove from the molds or slice them up into bite-sized blocks. Keep refrigerated and enjoy at leisure! I’ve been eating them almost every day for over a week now, and I have to say, I am starting to notice a difference in my body. My knees are noticeably less creaky, my other joints feel pretty good too, but the biggest difference is that my skin. Is. AMAZEBALLS. My face is baby-soft—I am not even exaggerating—and a lot of the fine lines around my eyes and mouth (which were already doing well under the care of my beef tallow skin lotion) have disappeared almost completely. It seems that Diane has had similar benefits from eating her gummies. The rest of the skin on my body also has a nice luster and a few scars that have been hanging around are fading faster. This all makes sense when you realize that gelatin is produced by breaking down collagen, a group of proteins used in connective tissues and structures of the body and a key component of healthy skin. It is likely that when we eat gelatin, our body breaks it down to produce more collagen in ourselves. To my knowledge this connection hasn’t been conclusively proven, but there is a lot of experimental evidence that routinely show correlation, if not causation. In my case, I think what might be helping me even more is something called MSM, which has been a part of my regular daily supplements for a few months now. MSM, or methylsulfonylmethane, is a sulfur-containing supplement that is also supposed to be good for connective tissue. I started taking it for the hell of it after my mom said that it improved the strength of her hair and nails. I was surprised to find that it improved my hair and nail strength as well, so I stuck with it. It is possible that the sulfur from the MSM is contributing to the reactions my body needs to break down the gelatin and create healthy collagen tissue. In any event, even if these health improvements are simply a placebo effect and not related to excess gelatin supplementation at all, I still enjoy the taste of the gummies, so that’s reason enough for me. UPDATE: If you are looking for more ideas for paleo gelatin recipes, check out my recipe for gingerade gummies. Ahh, well if you are a fellow horchata-fiend, there are some excellent recipes for actual drinkable paleo-horchata around, like this one and this one. Get your refreshment on! How coconut-y does this taste? I ask because I’m not a big fan of coconut milk in terms of taste. If I were to replace with milk, do you know how much I should add? 🙂 I’m pretty excited to try this recipe because I love horchata! It doesn’t taste too coconut-y to me since the cinnamon comes through pretty strong, but if you really dislike coconut then you might still pick it up (much like how I can taste the rancid infection of cilantro even after I’m sure I’ve picked it completely out of a dish). You certainly could use milk, mammal or almond! One can of coconut milk has about 1 3/4ths cup of liquid in it. Milk might reduce a little faster, since it has a higher water content, so you could probably go with about 2 cups of milk and still be good. Homemade grass-fed jello has been a staple in my house for a while now, but I’ve only ever made it with juice or tea, and with less gelatin (jello as opposed to gummies). I made these just tonight and “tried” them–by which I mean, wolfed down about a quarter of the batch. I may have overdone it. But oh my god that felt good. I can’t wait for my 2-year-old to try them in the morning. THANK YOU. Also I linked to this recipe from my own paleo blog’s FB page. Awesome!!! 😀 I am so glad you enjoy it! Let us know if you come up with any cool tweaks to the recipe! I just made these and they’re delicious! I added a little bit of vanilla, too. Nom nom 🙂 Thanks for the recipe! Made a 1/2 batch (did not have enough gelatin…those little knox boxes are tiny!) with vanilla – not bad at all. Kinda weird, and I think I need more sweetener in mine, but I’m willing to make it again. Super gummy, not at all like “Jello”. Question – how long were you eating them before you noticed a difference in your skin? I have eczema that has mostly gone away w/ paleo eating, but there are still some dry spots and bad days – how long til I can see the difference (or until the placebo effect kicks in- I want to believe!)? These are delicious!!!! I added a 1/2 tsp of ground ginger and 1/3 of a cup of lime juice as well. Anyone notice that their gummies separated with the coconut cream/oil hardening on top? It might have been because I put it in the freezer for 30 minutes like I usually do with my other gummies. Should I have let it cool on my countertop? I generally let gummy stuff cool on the countertop (takes longer, but better setting). Are you sure the gelatin was completely incorporated? How GUMMY should these be? I expected mine to be much chewier – like a gummy bear/gummy vitamin/fruit snack – than they are. Mine are just like slightly firmer jello. I used Knox gelatin and followed the advice Lisa (above) gave, could that have altered the gumminess? I commented before, but just made these again and have an easy way to incorporate the gelatin – an immersion blender! I sprinkled the gelatin on the hot mixture in 3 batches, blending after each one. Shove the blender tip on top of a pile of gelatin and whiz a few times. 1) Yep, just like regular jello, though hopefully more-so if you add more gelatin as suggested. 2) They’ll be perfectly fine out on a table for a day or so, but longer than that I would refrigerate them just to be sure (also to make sure they don’t dry out). Hi there. These look awesome! Regular cans here are 13.5 fluid ounces, which roughly converts to 400 ml, so that’s the one you’ll need! Awesome! So glad it worked! 😀 Enjoy!